The American Neurotology Society (ANS) is committed to improving public health care through the provision of high-quality continuing medical education (CME) to our members. The overall goal of the ANS Continuing medical Education program is to provide CME activities that will address the knowledge gaps and enhance the clinical competence of the participants. The ANS is dedicated to improving public health care through the development, dialogue and dissemination of advances in evidence-based diagnosis and management of neurotologic and related skull base disorders. The focus on the scientific advances in these combined fields is translated into approaches to quality care that are consistent with ACGME/ABMS general competency areas and the Institute of Medicine recommendations. The primary target audience includes members of both the American Neurotology Society and our sister Society, the American Otological Society as well as healthcare professionals in the fields of otology, otolaryngology neurotology and skull base research and healthcare. The members served include physicians, otologists, neurotologists, residents, fellows, researchers, nurses, occupational and speech therapists and other healthcare professionals who are involved in the care of patients with otologic and neurotologic conditions. Study groups & mini-seminars offered at the annual meeting of the American Academy of Otolaryngology-Head and Neck Surgery. Facilitation of manuscript submission on presented materials for publication in a peer reviewed journal (Otology & Neurotology). The content of the ANS CME program centers on clinical issues related to Neurotology and disorders of the skull base. 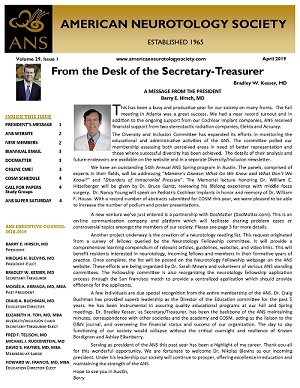 The ANS also strives to respond to our members’ educational needs that are not being met by other organizations, and therefore also offers activities in the areas of risk management, patient safety, physician-patient communications, coding, HIPAA compliance, and other regulatory issues as they relate to Neurotology. The educational efforts will also highlight the ACGME/ABMS general competencies within the context of this field and relate the significance of communication, professionalism, patient safety and systems-based practice within these workplace environments. The CME program of the ANS strives to enhance the participants’ knowledge and clinical competence in subject areas relevant to the field of Neurotology. The other expected outcome from this CME program is continued development of new evidence-based science, dissemination of ongoing research in the clinical area of Neurotology.